The weeks between Thanksgiving and the New Year are often cited as the most wonderful time of the year… except when they are the worst. In schools that begin around Labor Day, the Second Quarter – or second grading period – typically stretches from November to January. Due to holidays, concerts, sporting events, interruptions, and the occasional snow day, these winter months are busy and choppy. Routine and structure, so badly needed, are frequently sacrificed. By Thanksgiving break, classrooms in public schools across the United States have settled into a comfortable routine. But familiarity also breeds contempt. The September honeymoon period has long past, and the real work of teaching and learning is acute. The first report card cements what most students already knew: they are either good or bad at this thing called school. Furthermore, their grade level has changed, but their family’s socio-economic status remains the same. On January 2, 2018, the students and teachers will return to school. They will be tired, but also ready for a sense of normalcy. The third and fourth marking periods, although stressful for other reasons, can’t compare to the “happiest time of the year.” The weeks between Thanksgiving and Christmas hold unrealistic ideas of perfectly roasted turkeys, happy families gathered around well-stocked tables and glistening presents under trees. Those images are best left to movies and Hallmark cards. In reality, no family is perfect. No life is without challenge. Educators know this, and they help children and young adults navigate life’s bumpy roads. Schools are sacred places because they fill the gaps in the holes made by poverty, addiction, abuse, neglect, illness and modern life. 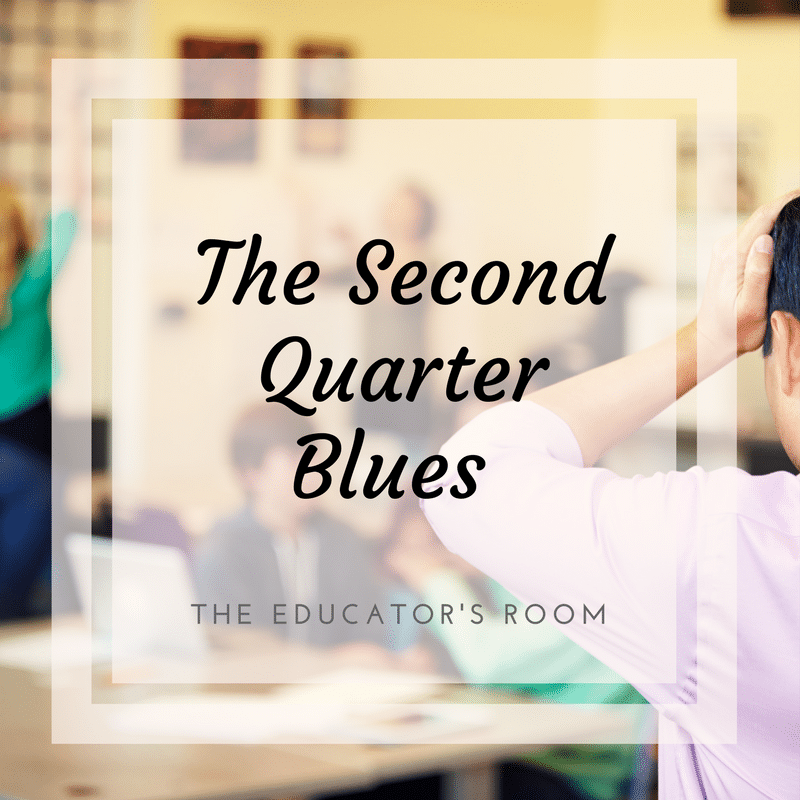 Three students and one teacher offer examples of the Second Quarter blues in school. For the sake of anonymity, all the names have been changed. George loves cars. My husband and I operate an automotive repair, so George and I have bonded over mufflers and rugged tires. He had a very negative previous year, but this year, George is doing well. He likes to pull his hoodie over his head and hide, but since the end of September, I have seen his face more frequently. And on his face, I sometimes notice a smile. He has significant learning issues, especially with his working memory. To put it mildly, George is a reluctant student. Last month, George handed in a project on the French Revolution that was so well done, that I excused him from writing the essay on the assessment. He was shocked, saying: “A teacher has never excused me from a test before.” He gave me a fist pump and went on his merry way. Since Thanksgiving, however, I have noticed that George has been retreating into his hoodie again. His homework incomplete, he tries to be invisible. His discussion of cars and his relationship with his benevolent uncle is now non-existent. I give him space, just like I did in September. I don’t push. I have learned that sometimes students like George need space to just exist as they are. My email dings. I read that George has a superintendent’s hearing with five days suspension and then will learn in our alternative setting. I don’t know what he did wrong. I could read the referral, but I don’t want to learn his mistake. I fear that I will never get him back to that place where he was excused from an assessment due to superb work. I may never physically get him back in my classroom. Whatever his infraction is, it might be big enough to prove that he needs a different program than our public high school. Like typical students at the high school where I am employed, Maria earns good grades and is involved in school activities. She is a pleasure to teach, but she silently struggles with anxiety. When Maria’s girlfriend breaks off their relationship, Maria spirals downward. Two of Maria’s friends approach me. They are distressed and aware of their responsibility: they must tell a staff member that Maria wants out of this thing called life. Maria’s pain is raw, and her friends are compelled to help her. Maria’s friends are young, but wise enough to speak. I am so proud of them and their leadership. I inform them that adult action must be swift. I am anxious to get Maria assistance but my administrator, and I had a pre-arranged meeting to discuss my recent observation. He is aware of my student concern, and we make our discussion brief. A student needs an intervention, so together we juggle the instructional and psychological aspects of our jobs. As the principal and I walk down the hall together, one of the school’s two social workers (an angel in a cardigan) appears. She makes time in her schedule. She pulls Maria into her office. She listens and assesses. Maria is helped. The adults take action. The two friends show compassion. I cry in my car during the ride home. I didn’t recognize the extent of Maria’s pain. I worry that she is not the only student suffering from hidden problems. However, I am so proud of the students who helped her. I am stunned by Maria’s bravery. I am so fortunate to work with such extraordinary people. I have the best, most painful job. If David were a soldier, he would be listed as missing in action. He is frequently absent from school, and when he is present, he sometimes wanders the premises. He is not a bad kid, but he is bad at school. His grades are low, he does not complete (or even attempt) assignments. He often acts hostile and is he extremely resistant to conforming to school norms like wearing hats in classrooms, talking when asked to refrain from speaking to his neighbors, and he swears like someone with Tourrette’s. David has an agreement with one of the assistant principals: he can go to her office during the part of the day that I see him. Her mission is to offer David a place where he can be his better self. During the weeks from Thanksgiving until Christmas, David is missing more, traveling the school more, swearing more — he is fulfilling his prophecy. It almost seems like he is daring for a teacher to write a referral. When David’s name is listed on the day’s in-school suspension list, it is no surprise. His infractions have multiplied, and he needed consequences. The public school system has a way of being the wall that students like David swim to — a catch and release philosophy — so that he might get a second chance. Bravo, Mrs. Jones! You always do such a great job, Mrs. Jones. We love you, Mrs. Jones. Thank you, Mrs. Jones. Her job fulfills her. It is ironically the calm in her storm. The only place she has any semblance of control. By the penultimate week before break, her facade begins to crumble. The piles on her desk increase, her lesson plans are more half-hazard, and she often cannot recall using the bathroom during the entire workday. She can’t keep up the frenetic demands–the self-imposed pace that she has modeled for her own children. The “achieving” life that she offers her students and her own kids feels false and hollow. I ask her: “Are you okay?” Mrs. Jones shakes her head in the negative and releases her reality on me. She tells me how old demons from her own childhood are manifesting in her oldest child. She explains that work is her only distraction. That when home, her reality is that she is in the fight of her life — the fight to save her child’s life from a mental illness she has also battled. I rub her back as she makes the appointment with the referred therapist. She is worried about break because she must face the reality of the hard work ahead. I am confident that Mrs. Jones will win the fight, however, because she is Mrs. Jones: the person so many people turn to when they need affirmation, support, and strength. There are many Georges, Marias, Davids, and Mrs. Joneses in schools across America. They are the norm, not the exception. The weeks surrounding the holidays illuminate the problems. Although students and teachers face considerable challenges, schools are often places of comfort, support, discipline, and routine. On January 2, 2018, the students and teachers will return to school. They will be tired, but also ready for a sense of normalcy. The , although stressful for other reasons, can’t compare to the “happiest time of the year.” The weeks between Thanksgiving and Christmas hold unrealistic ideas of perfectly roasted turkeys, happy families gathered around well-stocked tables and glistening presents under trees. Those images are best left to movies and Hallmark cards. In reality, no family is perfect. No life is without challenge. Educators know this, and they help children and young adults navigate life’s bumpy roads. Schools are sacred places because they fill the gaps in the holes made by poverty, addiction, abuse, neglect, illness and modern life.